The pituitary gland is one of the principal glands of the endocrine system. It releases at least nine hormones affecting a wide variety of body functions, including growth, reproduction, and levels of electrolytes and water in the body fluids. The pituitary sits near the center of the head, behind the nose and beneath the brain, just below the hypothalamus. The hypothalamus is a brain structure from which the pituitary receives chemical signals that control its action. Nerve endings from the hypothalamus stimulate the posterior portion of the pituitary to secrete oxytocin and antidiuretic hormone (ADH). 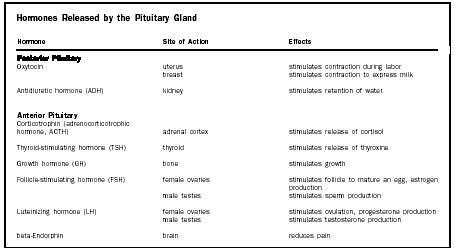 Capillaries from the hypothalamus carry releasing factors and inhibiting factors to the anterior portion of the pituitary, stimulating or inhibiting release of eight other hormones (see Table 1). All the hormones of the pituitary gland are peptides, small chains of amino acids . Both the hypothalamus and the pituitary are involved in complex feedback loops with other glands in the body, sending and receiving hormonal signals to maintain homeostasis. Because of its central role in so many systems, pituitary abnormalities can lead to a variety of disorders. Disorders may lead to either hyposecretion or hypersecretion . Deficient growth hormone, for instance, leads to dwarfism, while excess causes gigantism.